‘A blade in your ear still hurts more than a word in it, though,’ whispered Logen. Jezal spluttered with laughter, but Bayaz did not seem to notice. He was too busy hurrying from one stone bench to another. A few months ago I came across this very interesting discussion by Joe Abercrombie. I had become a fan of the writer since my review and his account of how he was unfavourably compared to J.R.R. Tolkien by Leo Grin raised a grin. This notion of moral relativism in fantasy is quite an amusing one, particularly since the last thing The Lord of the Rings is about is righteousness (Hobbits being made of much softer stuff than warriors and kings, yet in the end winning the day). The comparison was playing on my mind when I began reading this book though. After the events of the previous novel, Logen Ninefingers finds himself trekking into the wilderness in the company of a legendary wizard, Bayaz First of the Magi, chasing after a long-lost weapon. Colonel West has been handed the unenviable task of ensuring the foppish Crown Prince Ladisla achieves a safe military victory in the Northern territory of Angland. To the south Inquisitor Glokta has been assigned to protect the city of Dagoska from an implaccable foreign army. His mission is hopeless, but he is spurred on by his hatred for the people who broke his body under torture, leaving him a bitter and twisted shell of a man with a razor sharp mind. With the business of introducing the cast of this series done by The Blade Itself, Abercrombie concentrates on delivering sizable conflicts on a grand scale. The siege of Dagoska in particular is horrific, with Glokta using every trick he can think of to stall the Gurkish army in their progress. West finds himself in the centre of a rout when the arrogance of the Crown Prince, and a peculiarly wily enemy who outmaneuvers the main body of the army, forces him to flee a devastating assault. In the company of a motley gang of Northmen exiles he desperately tries to hang on to his civilized bearing and perform his duty in protecting the life of Ladisla. Unfortunately nothing would make him happier than to take the selfish prig’s life. To all intents and purposes it is Logen’s sections of the series that supposedly describe the central narrative. Abercrombie gives us a sense of scale with the different outbreaks of war, but Ninefingers and his fellow adventurers are evidently on a quest, of the sort most common in fantasy novels. This is where I began to think of the comparison made by the uppity Grin. As it happens much of the material was disturbingly familiar. Bayaz is a flawed and occasionally unreliable magus, much in the way of Gandalf the Gray. The group visit the devastated city of Aulcus, which reminded me a little of Moria with its ominous shadows and incredible grandeur gone to rot. My worry is that fantasy novels invariably begin to plough the same furroughs. I could mention that Robert Jordan also echoed Moria with his Shadar Logoth, yet another haunted city. Just how many wizards and weather-beaten warriors have traipsed before our eyes on the page over the years. The author here has a running joke that the magi all speak in riddles and circumlocutions, which few of the other characters have any patience for, a welcome criticism of the genre. 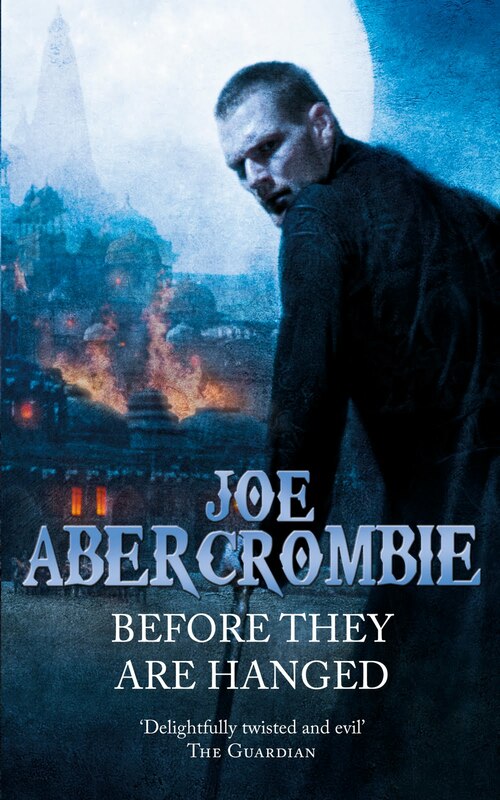 Abercrombie’s theme though is that the characters in this series The First Law Trilogy are in effect all monsters. Some are simply better at hiding it than others. Perhaps the material is familiar, but Abercrombie still invests his writing with far more bite than most out there. Plus these books are very entertaining and deliciously black humoured. I cannot wait to read the next entry.